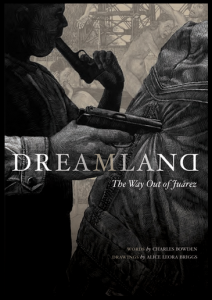 A first post is a necessary thing, so I will start with this quote from Charles Bowden’s Dreamland: The Way out o Juárez. I always think of Chuck’s work when I see photo essays about Juárez, of which I’ve seen a few. In one vein, I wonder why people risk their lives to tell a story that’s already been told so much better than they can possibly tell it? Why not tell some other story as yet untold? But I can understand an unwillingness to believe that a story has been told in such a way that it can’t be told better, or at least have another dimension added to it. And young men risking their lives for a photograph, or whatever reason? I’ve certainly been there, done that. What I can’t understand in these essays is why they never credit Bowden’s groundbreaking work on the subject. Are they not aware of it? Or do they just have bad manners? Either way, it’s unfortunate.